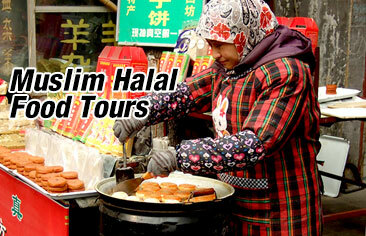 Islam in Guangzhou has mostly arrived through trade since the Tang Dynasty in the late 7th century. For thousands of years, Guangzhou has been an important trading centre and commercial gateway to southern China. Arab traders came to this famous port city and stayed, and a led to the development and spread of Islamthroughout China. Huaisheng Mosque is one of the oldest mosques in China. It is believed to have been built in 627 AD by Saad Abi Waqas, one of the important companions of the Prophet Muhammad, together with merchants living in Guangzhou. In honor of Prophet Muhammad, the mosque was named as Huaisheng Mosque, meaning ‘remembering the sage’. It serves as an important indicator of Islam's influence in the community of Guangzhou during that era. Located at No. 56, Guangta Road, the mosque was rebuilt a few times and covers an area of 2966 square meters and formed an expansive north-south axis, a Chinese asymmetrical layout. The entrance is a red-brick gate with a green roof on Guangta Road to the south, while the mosque complex is a U-shaped corridor enclosing a courtyard with a large Bangke tower to the north, followed by the prayer hall. Lying at the southwest of the complex is a lighthouse minaret, the mosque's most significant building. Standing at 36 meters high, this mosque is also known as the 'Lighthouse Mosque'. Another historic mosque in the city of Guangzhou is the Haopan mosque, built in 1465 during the Ming Dynasty and then rebuilt during the Qing Dynasty. The mosque is considered as an important religious venue in Guangzhou and was enlisted with the Guangzhou Municipal Key Historical and Cultural Protection Unit. Nestled in a quiet area of the Haopan Street, the mosque covers an area of 1,491 square meter. It was constructed in a garden style layout with the mosque's gate facing to the south and its main hall is located in the west. Like so many historic Chinese structures, it has been rebuilt many times. In 1994, the mosque undergone a major reconstruction and was reopened to the public in 1998. Guangzhou Xianxian Mosque is also a very significant historic Muslim site in Guangzhou. It was first built in 629 during the Tang Dynasty(618-907). The Mosque covers an area of about 1,860 square meters with a constructed area of about 1077 square meters. The prayer hall is a two-story building that can accommodate up to 3,000 worshipers. The mosque also houses a pavilion, wing room and other facilities, and are built in the architectural style of Ming Dynasty. Xianxian Mosque's other name is Hui Hui Cemetery. The garden-style cemetery was built to honor 40 famous Arabic Muslim missionaries. It is believed that Saad Abi Waqas died in Guangzhou, and buried there at the cemetery.